Expedition material and subsequent translations by Gary Vey. Information concerning the ancient ancestors of the Eastern Pueblos is scarce but certainly not totally missing. What contemporary descendants are able to tell us of their forefathers ranks high in value as we piece together the elements of this complex historical equation. The people came from the north to their present areas of residence, from the place of origin in Shibapu, where they emerged from the underworld by way of a lake. I suggest that just as we speak of the Old and New Worlds being separated from each other by two great oceans, this ancient Pueblo tradition portrays a journey from an earlier world through water to the present world. From our studies of emergence symbols coupled with inscriptions it is clear that emergence from the first world to the fourth and present world does not end the emergence cycle. Rather we are continuing to emerge with a potential to reach the Seventh World and the realm of Yah, whose name appears so often in the inscriptions of the Ancients. During their journeys they were led by the War Chief. This chief served for life. With his assistants and annually appointed captains and their staffs, they constituted a force responsible for clearing the path upon which the people traveled. And with them came the Great Spirit, and he guided the ancient ones through the many arduous tasks of daily life. For unknown ages the ancient people were led from place to place upon this great continent [North America]. Many of them finally settled in the four corners area [the junction of Colorado, Utah, Arizona and New Mexico], where they developed their civilization and settled for some hundreds of years before moving to their present homeland. As the ancient one related, it was in order to preserve the people from total annihilation that the Great Spirit impelled them to migrate. This they did, in groups and in different directions. Thus it is that the people created new dialects. The country where the ancient people lived was a vast open land of deserts, plains, and mountains. Here they built their villages and enhanced their lives. But they were filled with longing for perfection in their lives, harmony with their environment, and so they moved from time to time to other places with better sources of food and a better environment. (Sando 1975, p.17). The monumental constructions and prosperous communities that spread over a wide area from northeastern Arizona to northeastern New Mexico are called to our attention by Sando. He was concerned with pointing out that the great success of the Pueblo people was maintained because when "they came face to face with nature, [they] did not exploit her. They became part of the ecological balance instead of abusing and finally destroying it. "(Sando, 1976, pp.18-19). It seems probable that learning to live in harmony with nature was a long process (even for the ancients). The most ancient Hohokam prospered using channel irrigation and thus maximized the use of the waters of the Salt and Gila Rivers. 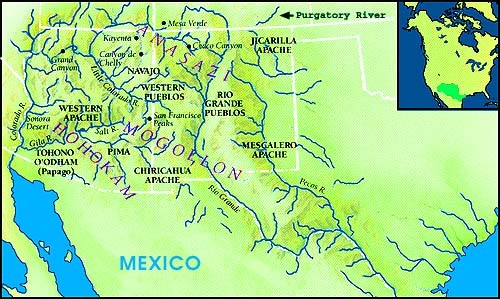 A series of dry years resulted in abandoning channel communities and removing some to areas near the river and extending colonization establishments to the Verde, the Little Colorado, the San Juan, the Virgin, the Lower Colorado, and also the Sevier River. Ancient tribes of the Southwest as envisioned and classified by modern anthropologists. These colonizations were sub-cultures of the Hohokam and their material remains were named by modern man as Sinagua, Anasazi, Fremont, Mogollon, and Patayan (the latter term is not a tribal designation but refers to a family of tribes located in the Lower Colorado River area). In these sub-cultures the building skills (stone construction), the agricultural technology and even the alphabetic writing system has survived on the rock inscriptions. The inscriptions seem to be most numerous in the early stages of the development of these sub-cultures (for example Anasazi, Basket-maker II, is the stage of the longest, oldest and most accurately constructed sign forms). The Classic period appears to have Great Kivas, and large condos but also to have lost completely the skill of writing and reading the ancient Southwestern script (or with the utilization of the Kiva, sacred things may have been written on perishable material kept in the Kiva). The different names given to these cultures has suggested to the minds of most modern investigators that these were different peoples. May we suggest while their ancestral roots consisted of a hybrid made of Old Semitic speakers up from Mexico and the very ancient Desert Archaic people that were in the Southwest "from of old," they were the same people whose culture was further modified by adapting to different environments and further encounters with other cultures. Why do people think that if you wear different shoes, and have different colored dishes, with different designs and some different tools to work with, you are a different race of people? In May of 1980 I was in Albuquerque, to participate in an ARARA convention, and had an opportunity to visit with Joe Sando and his lovely wife at their home just outside of Albuquerque. One of the statements made by Joe, among others that have stuck in my mind, was, "Why do people think that if you wear different shoes, and have different colored dishes, with different designs and some different tools to work with, you are a different race of people?" Archaeologists and anthropologists have differentiated these ancient cultures on the basis of something as superficial as their material cultural remains with the result described above. We now have something far less superficial to add to the unveiling of the origin of ancient cultures in the Southwest. We have a script of twenty two sounds, a language that gives it meaning, and small windows of history through which we can view the ancient religious ideas, and ethical values of these ancients. The above remarks do not mean that we regard the classification and orderly identification of material cultural remains to have been a wasted effort. These laborious scientifically reconstructed patterns of material cultural movement are invaluable in the determination of places, times, and movements of peoples with the rock art inscriptions that are coexistent with their artifacts. Since we are going to take a hard look at the inscriptions found in the Purgatory River (AKA "Picket Wire River") area of Southeastern Colorado the scientific study unveiling the Largo-Gallina Phase in north-central New Mexico will help us to see that there are some very plausible ties between Taos and Picuris (also Tanoans in general), with the ancient peoples that produced these inscriptions. In the description given by Wormington, this culture is described as "Pueblo-like" and fits into "Great Pueblo" times, although it is not entirely Anasazi. Tree-ring dates place the period of occupation from the beginning of the twelfth to the middle of the thirteenth century [a period when the great Southwestern cultures fade into small tribal units on the move]. It is possible that the inscriptions were composed centuries before this period and that reading and writing skills had been lost in earlier centuries. Dwellings include pit houses, surface houses of uncoarsed stone, and surface houses of coursed stone. Still later structures seem to be small pueblos. The Largo county site is in on the west of the continental divide while Gallina is on the east slope of the continental divide. Similar characteristics are found at both sites. Walls of homes are often four feet thick. Floors are often covered with flagstone, and roofs are of pole and adobe foundation with flagstones providing a shingle effect. In summary, these sites have been described as "a marginal Anasazi development from Basketmaker III to Pueblo I times" and showing foreign influence from the north (H.M. Wormington, 1947, pp.102-105, 176). The head waters of the Purgatory River are about twelve miles north of the Colorado - New Mexico border, just east of the continental divide. [The Purgatory River area] has a very complex history of occupation which has changed significantly previous ideas concerning the prehistory of the Purgatory drainage. An early pithouse on the western terrace has a ramp entry way not unlike Mogollon structures farther south in northern New Mexico. It is not unreasonable to expect Mogollon influence in the Trinidad region. All of the panels shown in this article are but a small part of a collection made by Phil Leonard and William McGlone within the last decade. In 1992, Bill McGlone allowed Brian Stubbs to sketch a selection of these inscriptions from his file of sketches and photographs kept at his home in La Junta, Colorado. Later, Brian allowed me (J. Harris) to copy his set of inscriptions so that I would be able to do some independent studies and work with the signs. I selected about twenty of the most promising panels for their similarity to Old Negev and because they appeared to carry clear letter forms. A major interest in them was to obtain a large enough sample of signs to determine if we are dealing with the same alphabet found in Arizona and Utah. There is no doubt, from the sign studies, that the Purgatory Script has a close tie with Old Negev found throughout the desert Southwest and in the Negev region of the Middle East. It is equally clear that the Purgatory script is a regional variation and, in addition to modifications in sign forms, may also have usage features that modestly differ from Old Negev of the more Western Pueblo ancestors. Brian Stubbs also mentioned that he was working with photographs and slides when he obtained the sketches used in this article and that he could not always be certain of the correct orientation of the signs (i.e. right side up or up side down). I (Harris) sent copies of the sketches back to McGlone and Leonard, asking that they identify any that were incorrectly sketched. They agreed to do so but never followed through. This could have meant that they changed their minds or that the orientations were all correct. If a few of the translated sketches are found to be up side down it will not change the general conclusions drawn here. The panel selection is too small to attempt a reconstruction of the language and script usage characteristics but some tentative possibilities and tentative translations will be presented in this article. We (Harris and Hone) would like to see Phil Leonard team up with a competent and courageous West Semitic scholar (one not afraid to challenge main stream canonized doctrine) and reconstruct the language and script usage in the Purgatory inscriptions (beginning where Harris and Hone left off). We suggest that there is a very great possibility, indicated by both the language and the script, that these ancients who wrote the Purgatory River [or Picket Wire River] inscriptions, were descendents of the Old Semitic speakers up from Mexico that became the Hohokam. They were likely members of the colony that were sent to the Virgin River area and, sometime later, whose descendents moved East, mixing with more of their Desert Archaic cousins. It is also quite possible that this eastward movement resulted in a loss of reading and writing skills which furthered diversity of dialects and languages. Pueblo brothers and sisters say "hello" to some of your ancestors, "Shalom."